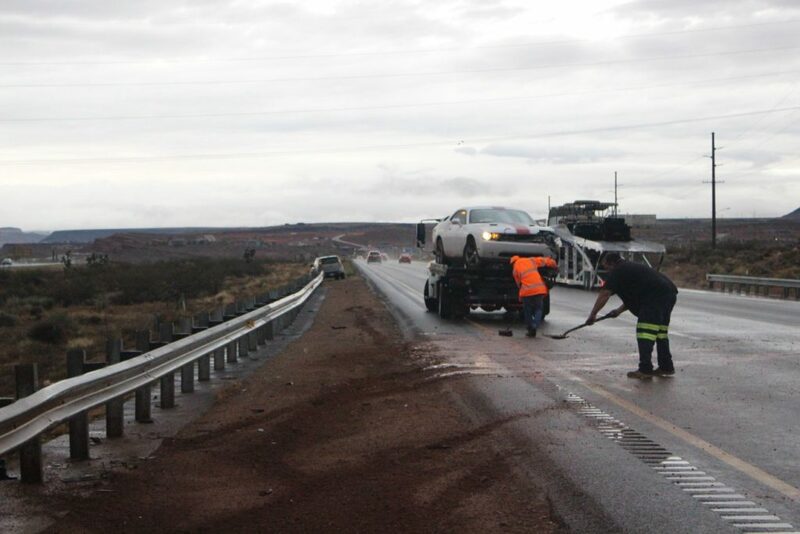 WASHINGTON COUNTY – Wet weather and speed were factors in multiple accidents on Interstate 15 Monday morning. One accident caused a traffic back up that led to at least two other accidents. 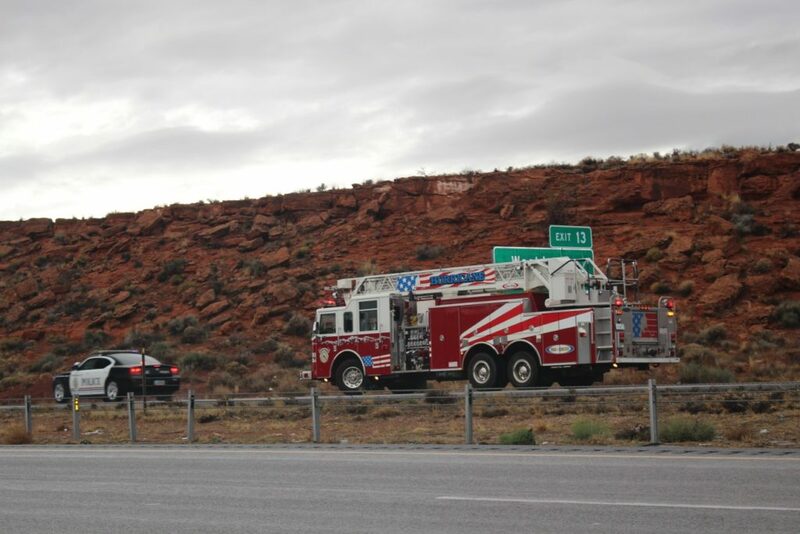 The first incident occurred approximately 8:30 a.m. when the driver of a Dodge Challenger heading onto southbound I-15 from Exit 13 lost control as he merging into traffic. 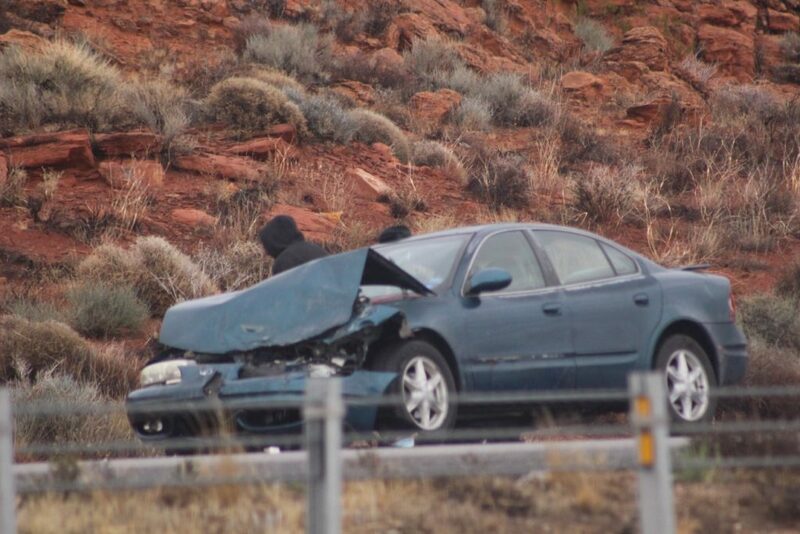 The Challenger slid left across the roadway, hit the guardrail alongside the road and spun around, Utah Highway Patrol Sgt. Jake Hicks said. The Challenger finally came to a stop and was blocking the left lane. 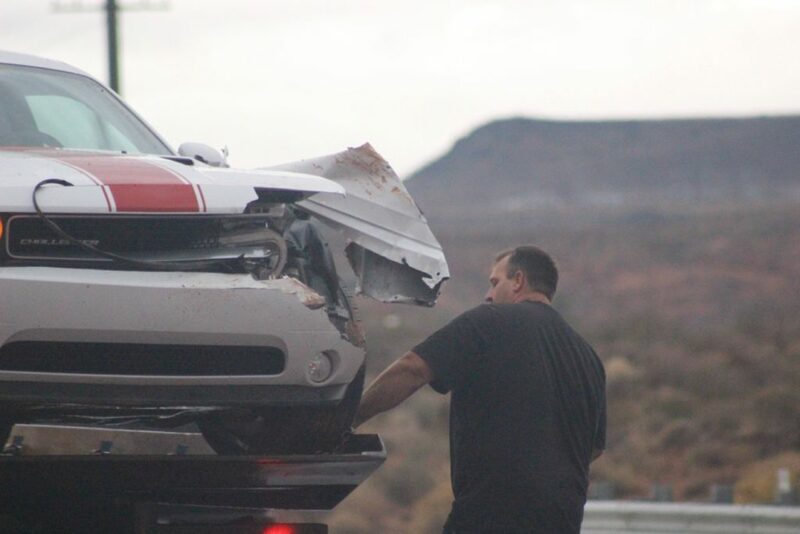 The front-driver’s side of the car was ripped apart as a result of the crash, and airbags went off. The driver was not harmed, however, and was wearing a seat belt. The wet roadway, coupled with speed and a pair of back tires that were bald, each contributed to the incident, Hicks said. 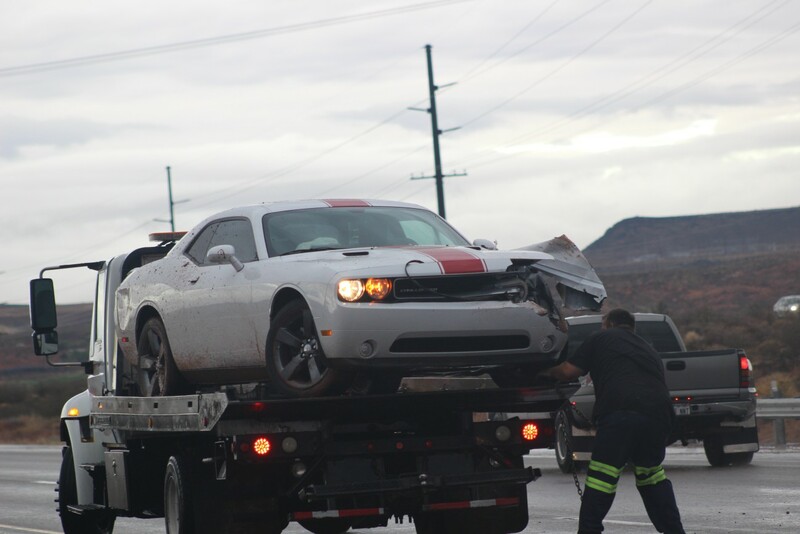 The Challenger’s driver was subsequently cited, he said. No other vehicles were immediately involved. 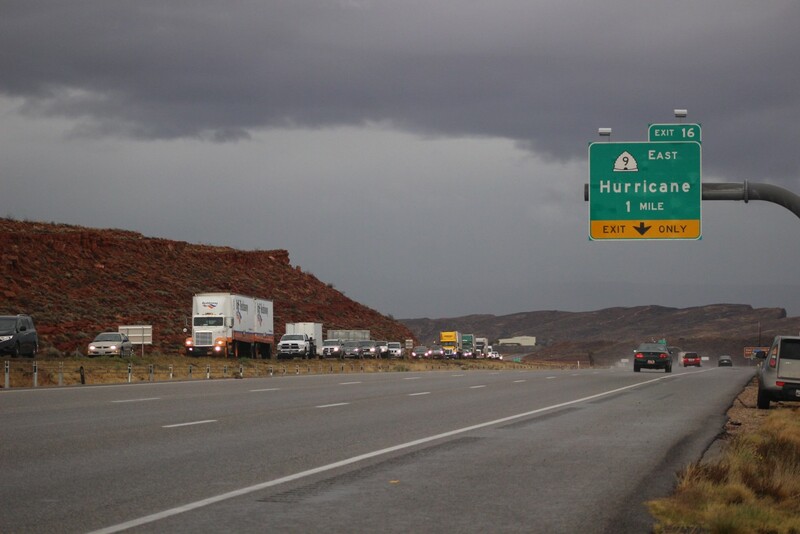 However, two other accidents occurred around milepost 15 on southbound I-15 as traffic backed up in response to the first crash. While Hicks did not personally respond to the second crash, he said no one was injured. 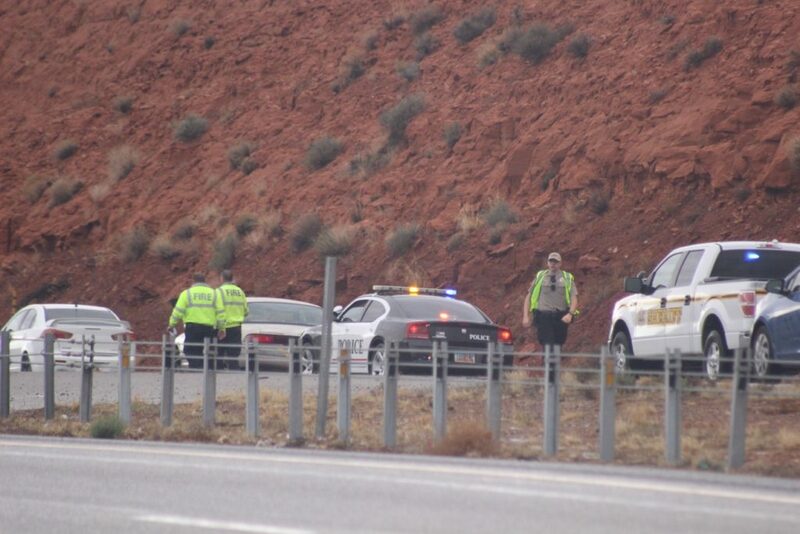 The same was true of the third crash Hicks took while another trooper handled the other crash. In the third crash, Hicks said, a green Oldsmobile Alero collided with a gray Honda CRV. The CRV was slowing and stopping for traffic that was crawling past the first two crashes. That is when it was hit from behind by the Alero. The impact sent the CRV off the roadway to the left, where it spun out and crashed into the cable barrier. All involved were wearing seat belts, and no one was injured, Hicks said. While the response to that crash was unfolding, another fender-bender happened on state Route 9 nearby. 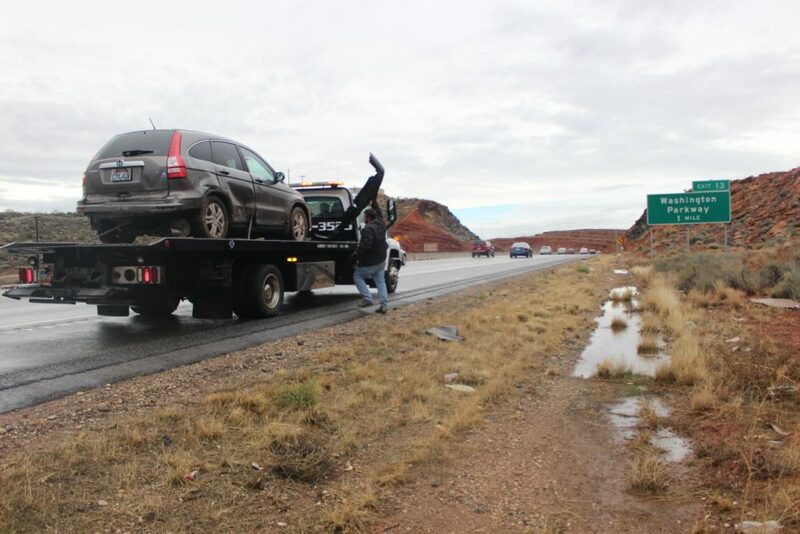 Hick also advised motorists that if they are in an accident on the highway, pull off the roadway if you are able, then call the authorities for aid. 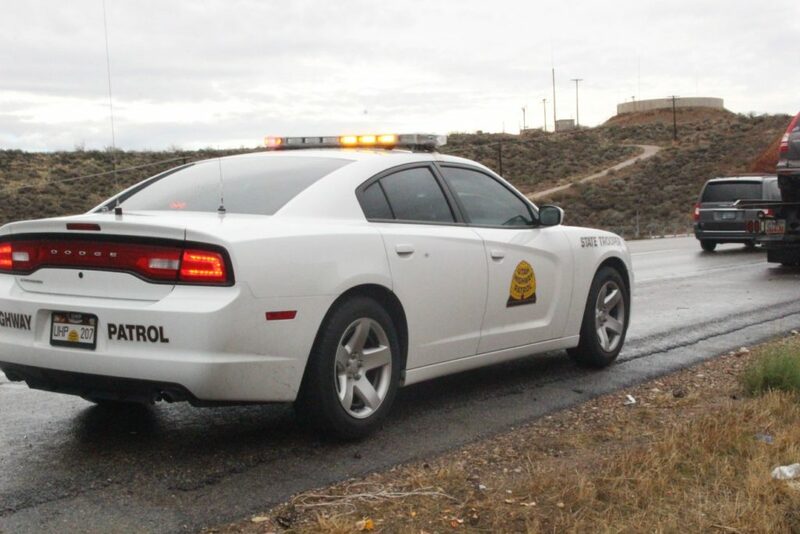 Remaining in the roadway is dangerous and can endanger not only the lives of those involved in the accident, but those who respond to it as well. Units of the Washington County Sheriff’s Office and Hurricane Fire and Rescue also responded to the incidents. Anyone knows that rte 15 going south from cedar city is downhill,and temperatures change fast.. Maybe there should reduce the speed limit and put more signs up saying slow frien.. Refund speed.. Ut would help..
Ur darn right speed was a factor–too slow of speeds! The higher the speed the safer we are on the roads. It’s in the open book test. Learn it and memorize it. It’s very important to always properly maintain your vehicle and be aware of the driving dangers brought on by storms. a properly maintained vehicle and slower speeds during storms should always be practiced. Be careful and slow down and make it home to your friends and loved ones. Just remember that it’s dangerous to take pills and drive. What is it with people around here driving with BALD TIRES??? It’s bad enough the roads are slick when it rains due to oils from the pavement, or slick due to snow/ice, but really people, you continue to drive around on bald tires?? That was one of the things I noticed when I moved here (besides the bad drivers).